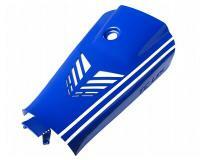 Blue battery cover from the TC-Line (Top Custom Line) from Opticparts DF, which means the highest possible quality styling parts with uncompromising design. The cover is made of stainless steel and coated with high-quality and strong luminous paint. The sporty duct design, and the high-quality and ODF TC-Line branding make this cover an eye-catcher. The delivery includes a transparent film and tape to store the air intakes and protect against water getting in. particularly great look if mounted behind vents with lighting! The white and black rally stripes are also in the package and can be applied. These have already been applied in the product photo for demonstration purposes.